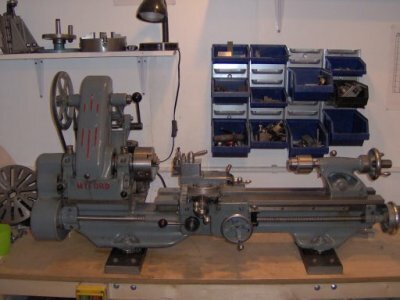 The lathe is capable of a huge range of operations, especially when combined with additional accessories and tooling. 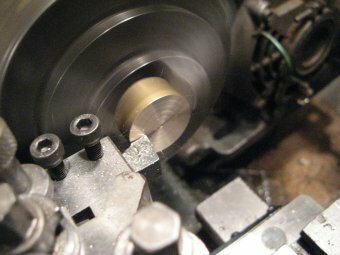 However there are 3 basic operations which cover many of the tasks done on the lathe. 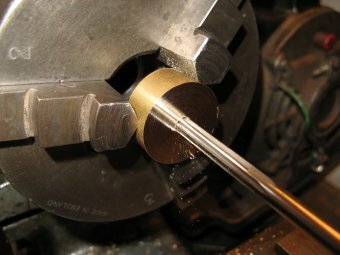 Turning a bar to length. To turn to a specific length first the bar was measured to establish the current length. 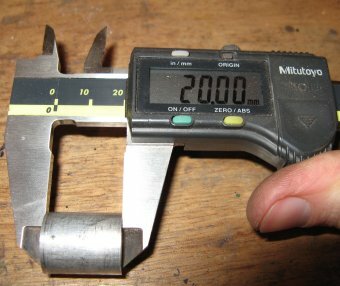 Before measuring both ends of the bar were faced square, so that it could be measured accurately. The 3 jaw chuck was used to hold the work-piece and each end was lightly faced to leave them both parallel. 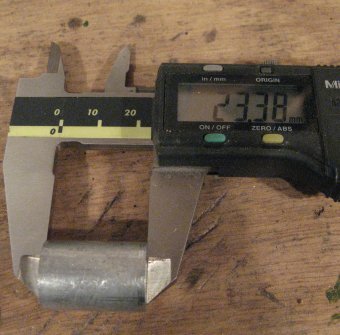 The Bar length was measured using a caliper and was 23.38mm. So : Current length - Required length = Amount of material to be removed. To remove this amount of material the work-piece was placed back in the chuck and the top-slide wound to zero. Next, the saddle was wound towards the work-piece until the tool just touched. This had to be done carefully and was the area most likely to generate error if not done sensitively. Now the top slide was used to take the required cuts. 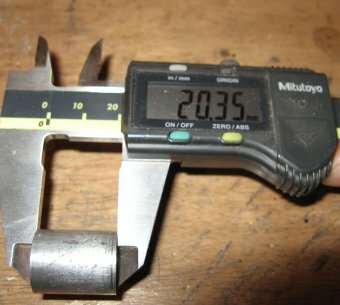 The top slide was incremented in 10 digit steps and after 150 divisions, the work piece was removed from the chuck to check the length. This was done because the amount to be removed was quite high and resetting the cut from near to the final length would remove any built up error. This re-measurement showed that an error of 0.03mm had accumulated. 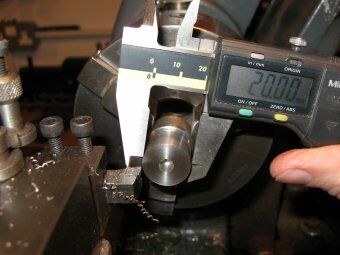 Next the top-slide was set to zero again and the work-piece mounted in the chuck to remove the remaining 0.35mm which was equal to 17.5 divisions. As with turning to length, when turning a diameter, first the starting diameter had to be found. The raw bar could not be assumed to be perfectly round, nor the chuck completely true and so a light cut was taken to give a datum surface. 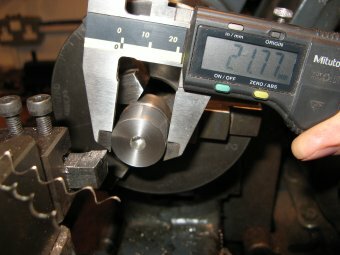 The plan was to turn to a diameter of 20mm in this example. This datum cut was taken with the cross slide dial set to zero, to make subsequent cuts easier. The starting diameter was measured and the required diameter subtracted to determine the cut to be taken. So : Current Diameter - Required Diameter = Amount of material to be removed. 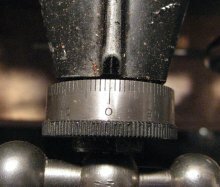 On this Myford (with metric conversion) each division on the cross-slide was equal to 0.04mm off the diameter. So the required cut was a total of 1.77mm / 0.04 = 44.25 divisions. The cross-slide was then incremented in steps of 10 divisions to get close to the final diameter. Periodic checks were made and the amount to be removed recalculated, as the component neared final size. 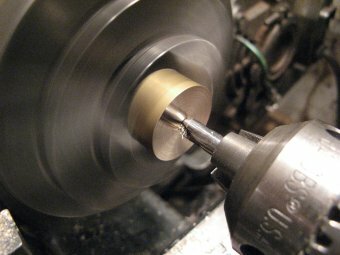 Rechecking was easier than when turning to length because the material could remain in the chuck. 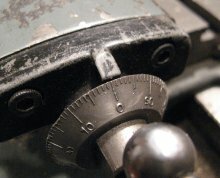 The lathe power feed was used to give the best surface finish in the final cut. 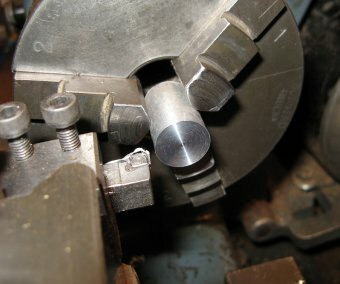 The tailstock can be used to drill holes in the centre-line of the lathe. In this example a 5mm through hole was drilled in a brass off-cut. First the face of the work-piece was cut square to prevent the drill from wandering or slipping off centre. 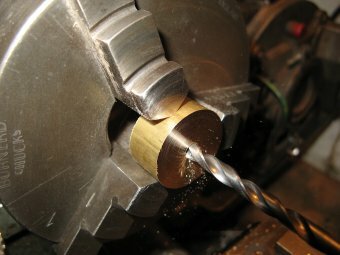 A centre drill was used to accurately mark the centre. The centre drill was used to a depth deep enough to fully guide the tip of the next drill to be used. For this 5mm hole, the next drill to be used was 4.5m diameter. Drills were used in progressively larger sizes up to 0.1mm below the final dimension, in this case 4.9mm was the last drill used. 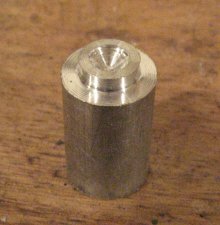 The hole was finished to final size using a reamer. 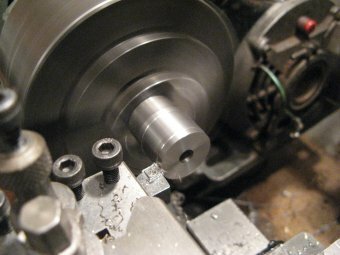 The lathe was used on the lowest open speed or highest back gear speed for this operation.